On the 2nd of September, 2017, I happened to attend the Premier School Exhibition, held at Expocentre, Sector 62 NOIDA. The exhibition was a great platform for the whole list of schools in NOIDA to showcase their values and exclusivity. It was a delight to be among school leaders, students brimming with vibrancy, and a pleasant commotion of parents. If you look at the list of schools in Noida, you would have seen the cream of the city there. Most school booths had a certain area dedicated for play. So the parents can have a discussion with the school’s team, while the kids are busy playing or coloring right next to them. Among all the school stands that I visited there, one particular school caught my attention. Certainly, Global Schools are now making it to the top of the list of schools in NOIDA. I noticed some colorful numbering on the posters in the background, which got me curious. I decided to spend some time with the team at that stall and try understanding the ethos of the school. For me, the ethos of a school means more than mere accolades, because a child may or may not win something because of the school, but how the culture of the school is, shapes their demeanor for life. I got into a conversation with a gentleman at the stall. I asked him about what these numbers meant. So he told me that these are the number of ways we ensure each child is provided the true #GlobalAdvantage. Amongst these, I was thrilled to learn about the unique 9 Gems program that Global Indian International School has. He called it a holistic teaching methodology. He asked me, what’s your focus as a parent if you had to choose between co-curricular & Academics? And I happily answered that it’s Extra-curriculars. He said for sure your child is in the primary section. That was in fact, right! ‘As soon as kids reach the 8th or 9th standard, parents want them to follow a strictly academic approach because, at the end, marks do matter’, he added. He reiterated that with the certified 9 Gems program, the Global Indian International School ensures that the child develops holistically. The focus is on academics, Sports, visual & digital arts, personality development, creativity & problem solving, leadership skills, life skills & the like. The Global Indian International School as a school focuses on all the aspects, even if broadly divided into just extracurricular and academics. So if a child has been attending a 3 day trip to a different city representing the Global Indian International School on a national level for a competition, when he returns, the entire staff focuses on helping that one single individual to pick up on where he has been lagging. So while the child was busy garnering accolades for sports in co-curricular, the school prepares itself to help the child gain a boost in their academics. This seemed very interesting and quite a unique model to me. The ethos of Global Indian International School is built upon the idea that the students, as well as teachers, basically need to be happy to learn or impart learning better. Frequent learning programs for teachers, beautifully decorated, colorful classrooms, lush green lawns, add-on to the aesthetics and eventually happiness. The school encourages concepts of self-learning & peer-learning along with classroom learning. This helps kids build bonds and learn in a more convenient way. The Global Indian International School gets an index value by constantly seeking feedback from meetings and questionnaires for children as well as parents. It is something that their system is quite proud of, and should be, actually! Schools play a major role in how an individual shapes-up to be and hence, it is quite important to make an informed choice. 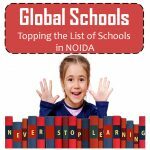 If Global schools are making it to the top of the list of schools in NOIDA, they are rightly doing so. You can read more about the Certified 9 Gems Program by The Global Indian International School here. You can read more about the Happiness Index here. The Global Indian International School is now open to admissions. You can check more details here and send your inquiries here. If You like this Post, do SHARE it with your friends & Family. I’m taking my Alexa rank to the next level with Blogchatter, what about you? That’s a great step that this school is taking.. usually when a child becomes active in co curricular activity , he / she tends to loose his / her connect with academics and thus at times parents do not encourage the co curricular activities. I am sure this step will bring much more success to the children here. A lot has been changed the way schools operate back then & now.. This is a great initiative taken by schools.. Very informative post and love the concept really. Nice post and good to see that schools are coming up with new ideas and initiatives to make studies fun and enjoyable rather than being a burden on students and parents . Good to know about the top school in Noida. Will help Noida parents for their kids education and welll being! Thats a really great step towards future. Really informative and interesting post for people out there. This school is truly focusing on the all round development of the children. Will surely spread a word about it amongst my Mom friends in Delhi. Heard a lot about this school that is in noida. It’s near to my city so thanks for sharing about it as I am also searching best schools near my place for my little one. Global schools are really in trend! They provide really good and high quality of education to kids. Its excellent that Global International school focuses on holistic developement .Its great that theres an option like this. The school is doing really good. This step will help kids to engage in activities too.